Universal Studios Japan is holding its seasonal Universal Surprise Halloween even this year which consists of three elements: Otona Halloween, a sophisticated event for adult guests, Zekkyo Halloween, which is intended to make people scream, and Kowa Kawa Halloween for kids to enjoy. In this article we take a look at Zekkyo Halloween, which translates to “Screaming Halloween,” and aims to scare the life out of people. ‘Zekkyo Halloween’ is synonymous with USJ’s Halloween-time. It’s a participation-based experience that has taken fear to the next level this year. A range of different repulsive zombies will take to the streets in each area to get hearts racing. There’s also the Zombie de Dance where dance with the zombies, a horror maze where you are chased by killers and demons, a maze where you must clear a mission and where the decisions of the participants will decide on who survives, and more. 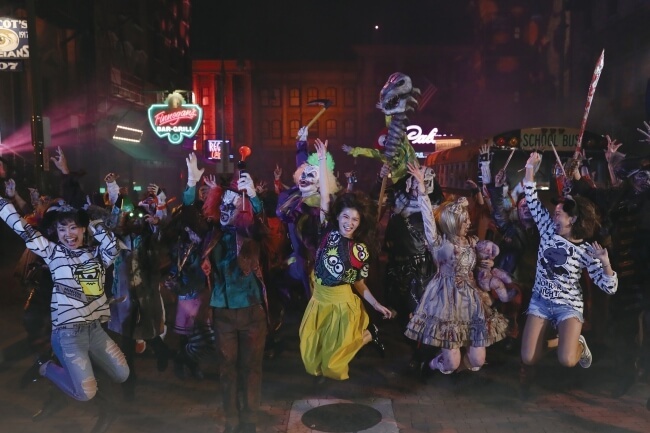 During the Zombie de Dance where guests participate, tons and tons of zombies will all of a sudden come out of nowhere, including zombies dressed as clowns, gorilla zombies, zombies dressed in suits of armour with spears carved from a tree, and more, all to make the guests scream. While guests run and tremble with fear, foot-stomping music will start playing and the zombies will start dancing. Guests are invited to join the Thriller-esque scene. Even guests who are at first hesitant will find themselves joining in the dance. There’s much to be enjoyed at USJ this year for Halloween. Whether it’s Otona Halloween, Zekkyo Halloween or Kowa Kawa Halloween, you’re sure to get your fill of fun and spooks!